Mannheim/Germany – Hosted by the German Marketing committee of Fieldbus Foundation, this free conference offers an overview over the development in fieldbus technologies during plenary lectures and its application on process plants. Developers and decision makers of automation solutions and process components give an overview of the current status of bus technologies, while several panels offer the opportunity to exchange with other professionals. Topics like Control in the Field, Fieldbus for security applications and remote operations management will be addressed. Well–known professional journalists and editors will be chairing the discussions, among them Gerd Kielburger, editor–in–chief of PROCESS magazine. The conference will be held on February 1st 2012 at Feierabendhaus Knapsack, Hürth/Germany. While we were at our Media Day Event at Lee College on December 1st, Peter Welander from Control Engineering shot some good videos of our FOUNDATION for ROM demonstration unit, the fieldbus training facilities at Lee College, and more. The first of those videos is now available at the Control Engineering web site and is essentially a description of our demonstration unit and a simple explanation of how FOUNDATION for ROM works, and how it can provide value to end users in remote operations. Look for several more videos to come. Emerson Process management has won another fielbus project, this time at large Zinc and Lead smelter in China. The project will expand Yunnann Chihong Zinc & Germanium lead and zinc processing pant in Yunnan province to over a million tons of capacty over the next five years. The project will incorporate a DeltaV digital automation system with FOUNDATION fieldbus and WirelessHART devices with an AMS plant asset management system. According to the press release, “The new automation system will help improve smelting efficiency and reduce energy consumption in the lead ISA furnace process and zinc pyrometallurgy process, as well as efficiency in sulfur dioxide emission control and waste heat recovery. The company hopes to reduce both maintenance and energy costs with the project. We have uploaded the presentations from our FOUNDATION for ROM Media Day to our Slideshare account, you can access them here. In the set you will find my overall presentation on the business value of FOUNDATION for ROM, Dave Glanzer’s technical presentation, the description of the demonstration unit, and Herman Storey’s presentation on the end user perspective. 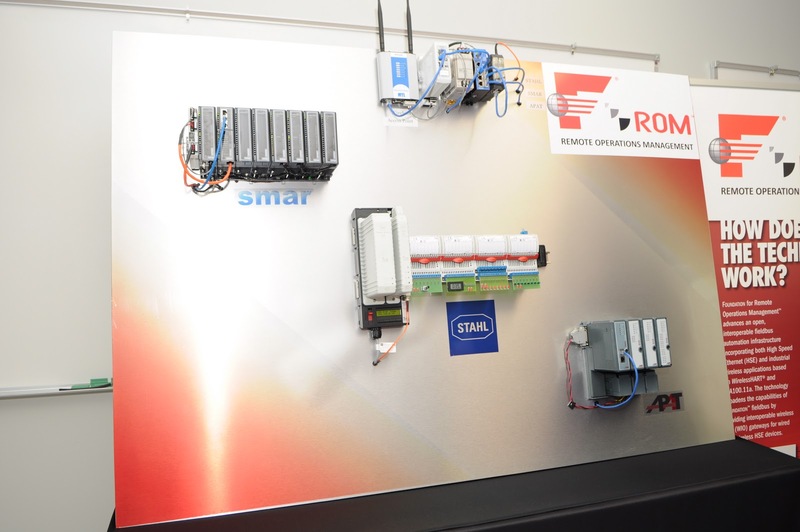 The Fieldbus Foundation unveiled its FOUNDATION™ for Remote Operations Management (ROM) solution at a media event held Thursday, December 1, at the Fieldbus Center at Lee College, Baytown, Texas. Representatives from all the major process automation related media outlets attended, as well as a lot of end users and educators. As you may know, Lee College is one of our Fieldbus Certified Training Partners (FCTP), and we incorporated a tour of the fieldbus and process automation educational facilities and pilot plant into our schedule. We have been talking a little about FOUNDATION for Remote Operations Management on this blog, but last week was the “official unveiling” of our new approach to remote operations, and we got a sneak peak at some early prototype devices that we have been working on in our labs as we develop the overall specification. FOUNDATION for ROM provides a unified digital infrastructure for asset management in remote applications from tank farms and terminals to pipelines, offshore platforms, and original equipment manufacturer (OEM) skids. The technology enables fieldbus connectivity to remote I/O and the leading industrial wireless protocols, including WirelessHART® and ISA 100.11a. It provides an interface to these wireless technologies and uses Electronic Device Description Language (EDDL) and function blocks to ensure interoperability with FOUNDATION for ROM devices. 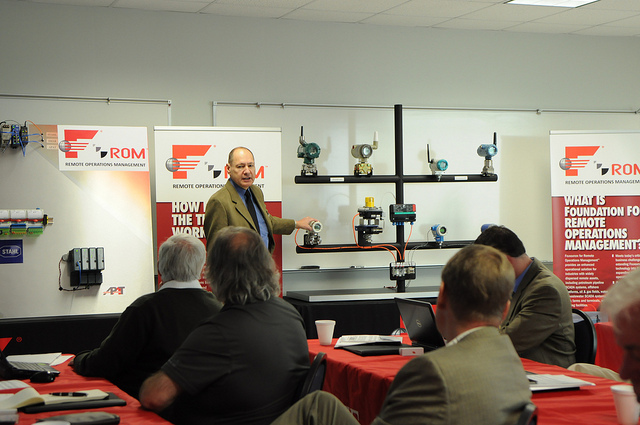 The media event featured FOUNDATION for ROM technology presentations and demonstrations, followed by a tour of the Fieldbus Center at Lee College, one of the Fieldbus Foundation’s FOUNDATION Certified Training Program (FCTP) partner sites. The Fieldbus Center facility is dedicated to training the next generation of process automation operators and technicians. FOUNDATION for ROM is important because it is the first example of being able to integrate ISA 100.11a, WirelessHART, wired HART, and wired H1 protocols into a single standard environment. More importantly, it is one that does not sacrifice diagnostic capabilities of the existing wireless devices. Instead, we map these capabilities into our block structure to provide a standard environment for data management, quality, and more. Today’s solutions are highly customized and much more costly to maintain throughout the plant lifecycle. I’ll be doing more blog posts about the demo unit, applications, and other resources related to FOUNDATON for ROM in the coming days and weeks. In the meantime here are links to some more information related to ROM.